No way. I went to get some delicious food at Marla's the other night, and she told me that her son, Matt, had now started up a late night delivery service of her awesome food called MUNCH. Her AWESOME food, at two, three in the morning, when you get back from a show and nothing good is open and nowhere good delivers ... Now you're all set. Carnitas tacos (the very best, and I've been to Juanita's Carnitas in Encinitas). Wings. Salads. Soups (with perfect, melt in your mouth rolls). Every kind of sandwich, from eggplant to pulled pork, veggie to steak, all with great sides. Lasagne. Drinks (soft ones, as you've probably had the hard ones by the time you're ordering). Every last bite like someone's great cook Mom made it. Because someone's great cook Mom DID. 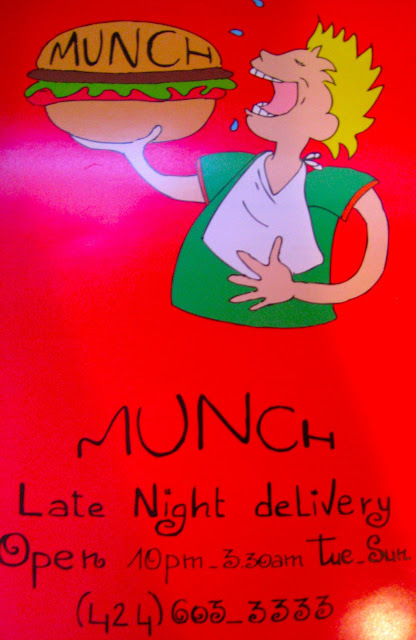 Munch will deliver to you, Tuesday through Sunday, 10pm - 3:30am.